ZIMBABWE – Three women stood helplessly as their nine-roomed, roof-under-tile house was being razed to the ground by Harare City’s Council’s giant bulldozers. The demolitions were taking place at a residential settlement along the Joshua Mqabuko Nkomo Expressway, after President Robert Mugabe described the houses as an eyesore. One of the women, of Nigerian origin as was later confirmed, shed tears as she watched her family investment reduced to rubble in a matter of seconds. “This is sad. But we bought this stand and we were assured that the land was legal. How can this happen like this,” cried one of the women, trembling with rage. There was nothing the victims could do to resist the more than 50 armed municipal police officers who were standing guard as the bulldozers pulled down the houses. More than 30 houses have so far been demolished in the settlement and more than 1 000 are expected to go down this week. A shaken man, also a victim and neighbour to the Nigerians, said he was called by his wife who told him of the demolitions while he was at work. “Only last week, we went to see Local Government minister Saviour Kasukuwere on the issue and he said he was only reading about that in the newspapers. “But today I was called by my wife while I was at work saying they were demolishing houses here,” he said. Two of the family’s wardrobes had posters of Emmanuel Makandiwa of the United Family International Church and another of Walter Magaya of Prophetic Healing and Deliverance Ministry, an indication the family was of a Christian background. A woman, employed by a local bank judging by her uniform, could also be seen crying while taking out her property to a waiting truck. At one of the houses, six children and their mother sat as they watched their house standing for the very last time as the bulldozer operator drove towards it. They looked distraught and could not stand or speak. Questions on how they felt drew blank gazes. People were also asking what wrong they had done to deserve such treatment from government and council. “Then you hear someone saying Zimbabwe is free,” remarked one man as he passed by the rubble. Several people who came in to witness the demolitions were from a nearby settlement, and their houses are also likely to go down this week. “From here, they are coming to our houses. Imagine if they can demolish such big houses, ours will also be brought down,” said one of the residents. Council police got physical and attacked a man they suspected to be mobilising fellow settlers to resist the demolitions. The man was dragged to the council truck nearby where he said he was interrogated before being released. Houses along the Expressway were demolished after an order by Mugabe, who said the houses were an eyesore and should be removed since they are too close to the Harare International Airport. The MDC-T, which controls Harare City Council, accused Zanu PF of demolishing people’s homes, describing the move as unconstitutional. 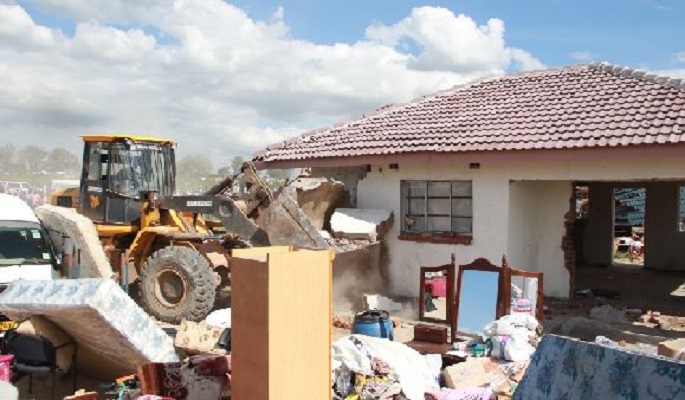 “We call upon all local authorities in the country to exercise restraint and circumspection when it comes to the decision to demolish houses,” MDC-T spokesperson Obert Gutu said. The demolitions began last year and council has vowed to continue with the exercise until it rids the capital of illegal settlements.